March 21, 2017 By Chris Freytag & filed under Blog. When you’re working out at home, it helps to have a game plan to hold yourself accountable. Consider your main goal. Do you want to tone your body? Lose those extra pounds? Feel more energized? Find workouts that line up with those goals and plan them out a week or even a month ahead of time. And if you need help creating a workout schedule, use one of our workout calendars! We have 28-Day Workout Calendars that tell you which workouts you should do every day to get specific results. 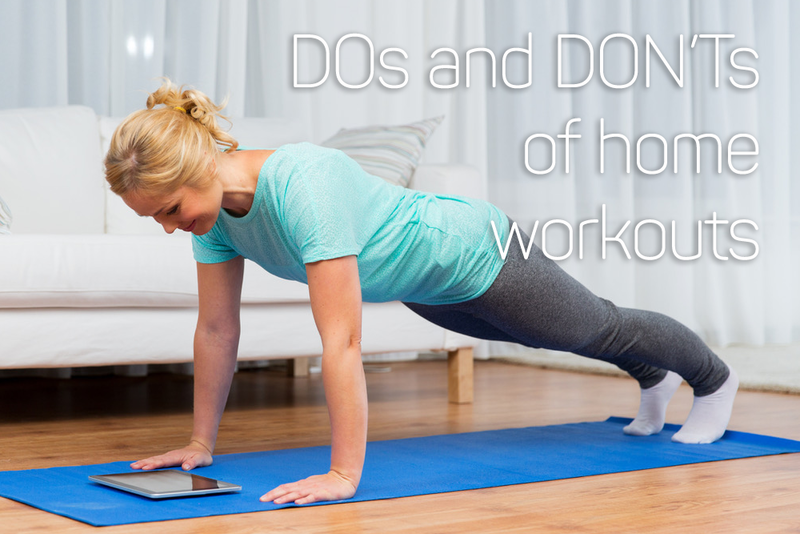 Just because you’re working out at home doesn’t mean you should skip the warm up and cool down! Skipping these steps can cause injury and prevent you from getting the most out of your workouts. We like to think of the warm up as the “dress rehearsal” for whatever workout you’re doing. If you’re going to be running, warm up with walking. If you’re doing a HIIT workout with lots of plyometrics, warm up with low impact bodyweight moves to get your joints ready. Ease into your workout with the warm up and reward yourself for a job well done with a cool down where you hold gentle stretches and prevent your muscles from being sore the next day. When you’re working out at home, it can be tempting to get distracted by that pile of laundry that needs folding, a never-ending list of emails, or little ones that somehow need a snack every five minutes. That’s why it’s important to designate a time and space where it’s JUST YOU and your workout. Many people find that working out in the early morning is the best way to accomplish this—they get their workout done before anyone else is awake. And you don’t need an entirely separate room to workout in; you can use your living room or any room, really, as long as you have a little space to move around. When you’re working out at home, the world is your oyster. You don’t have to wait in line to use a machine, and you don’t have to feel like you’re “on display” at the gym if you want to try a new type of workout. This is your chance to try something you’ve always wanted to do, but maybe have felt self-conscious about. Do you want to dance like nobody’s watching? Give an online dance class a try in the comfort of your own home. Want to try HIIT but nervous that you won’t know what you’re doing? Follow along to an online HIIT class and just do your best—without feeling like you’re competing with other people in a group setting. Step out of your comfort zone—you might just discover your new favorite workout. There’s nothing wrong with a little positive reinforcement. If you’ve stuck to every one of your workouts for the week or month, treat yourself to something healthy—like a new pair of workout shoes, or a relaxing pedicure. Whatever will motivate you to check those workouts off your list and keep going. Because when you workout regularly at home, you realize that the best workouts are the ones you are motivated to do—and the feeling of accomplishment afterwards isn’t so bad, either. What’s your favorite workout to do at home? Let us know in the comments! Could you tell me how many calories I burn during a 5-minute plank exercise? I am a 60-year-old female, 130 pounds. The average 140 lb woman burns around 100 calories every 10 minutes working out at a moderate to intense rate. Since holding a plank isn’t aerobic, I would guess you burn around 20-30 calories in 5 minutes. You do get great health benefits from all of those muscles that are getting stronger in your arms, back, and abs. Planking is a great strength exercise! Although you burn more calories doing cardio, exercises like the plank build muscle and strength. I hope this helps! Are you a member of our private, exclusive Face book Group? It’s a group of engaged women who follow the calendars and discuss the workouts, recipes, and share info like this. If not, please join – search for Get Healthy U TV Members and ask to join!! Are these free downloads or for members? Hi, Carol. This is a free article, which you may print off. If you have any further questions, please contact us at 1-844-278-2050. I am a 61 year old female. I sometimes do a bit of yoga and some cardio excercises at home but I fall by the wayside every now n then. I am about 20 kgs overweight and seriously need to lose the weight. Any suggestions? Sounds like you have the right idea but might need to hear this word: consistency! Its time for you to set an appointment for yourself and make your health your priority. You would put important meetings on your calendar, so putting yourself on your calendar is the only way to prioritize your health and fitness. Set aside a specific time 5 days a week – 20-30 minutes each time – to get your exercise in. Whether you go to a gym, do a blog workout at home or use one of our hundreds of workout videos on GHUTV, just make the time and do it. Trying now and then but falling off the wagon will not help you reach your goals. It has to be priority. Of course a big part of losing weight is eating well. It’s the best time of year to clean up your eating and look for whole, healthy, fresh foods that are filled with protein, complex carbohydrates and healthy fats. Lots and lots of vegetables! If you have a round plate in front of you, half of it should be green vegetables, one quarter protein such as organic chicken or beef, and one quarter complex carbohydrates such as brown rice or sweet potato. You can do this! Just make yourself a priority.